It’s all about reading and community engagement at Montville State School and the Daily Rapid Reading Program certainly has been a huge success resulting in positive outcomes for all involved. There is a group of 15 volunteers from the community who are giving their time to provide reading support every day to individual students. There are over 30 students in the program currently. The school would love more assistance to extend the program and are currently looking for anyone who would like to volunteer as little as one hour a week to help. On Wednesday 5 September we will be holding our Prep Open Morning for anyone interested in enrolling their child at Montville in 2019. This will be an opportunity to come and meet the staff, see our learning spaces and ask any questions you may have – All are welcome! Our school continues to grow. So far this year we have welcomed 134 new students and their families to the Montville State School community. 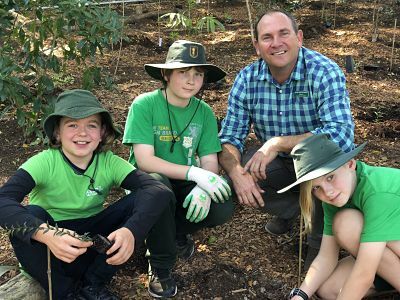 National Tree Day was celebrated at Montville State School with the planting of over 100 trees. All students planted a tree, participated in art activities, learnt about the importance of trees and wore green to commemorate the day. Students took a well earnt break and had their lunch under the trees. A lot of work by volunteers went into preparing the site and a working bee the weekend before meant that holes were dug and mulch was spread before the day. 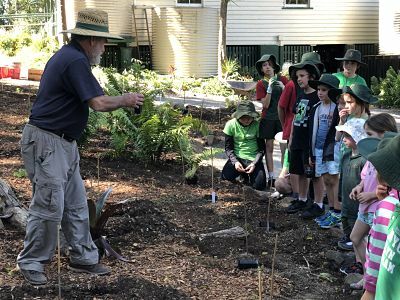 Many businesses and community organisations donated plants and materials and volunteers participated and helped to co-ordinate the day to ensure it was a success. Our Friday afternoon assemblies continue to be quite the social event, with many families staying to enjoy home-baking and complimentary tea and coffee afterwards. The students play in the playground whilst parents can catch up. Assemblies are a great opportunity to find out what is happening in the school. There are always visitors from time to time and last week Andrew Wallace MP came to catch up with the students and present the weekly awards. Thank you so much to everyone for supporting our school and students. We look forward to sharing more positive school news with you in the next edition of Happenings.